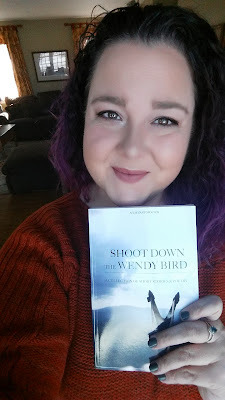 Shoot Down the Wendy Bird is a book of short stories and poems written by Julie Zantopoulos a really cool, down to earth girl who is living the dream of being a published author. I haven’t met her in person but have known her for almost a year now. Julie has helped me with my own writing and is all about women helping women. Which you know I’m all about! When I offered to review Julie’s book Shoot Down the Wendy Bird something told me it would be nothing short of awesome but I wasn’t ready for the stories that I stayed up late at night to read before bed. I became captivated. I felt the stories were so special I asked my daughters to start reading this book with me and then they became hooked. We would sit in my bed as I’d read and they’d hang on every word. What makes this book so damn good? Shoot Down the Wendy Bird is full of short stories about love found and love lost, about trust and betrayal. Regardless of where you’re at in life you’re bound to see yourself in one of these stories. Be warned, you open the cover knowing these are short stories but as you find yourself getting to know these characters getting a glimpse into their lives you’ll want to know what happens next. Shoot Down The Wendy Bird does just what any good book should do, it gets your attention, it stirs up emotions and just when you let your guard down it ends leaving you wanting more. Continue reading for Julie's interview and for a chance to win your own copy of Shoot Down the Wendy Bird. Are the stories based off of any personal life events or people? You don’t have to name names. There are a few stories that are based off my life and my experiences but as for stories based on friends that I know or others in my life, no. There are bits and pieces of people I know in characters perhaps but I really only pulled from my imagination and my life. First Day of School, A Moment of Truth, The Storm and A Light in the Darkness were taken from my life. Bits and pieces of other stories are taken from my life as well. I do suffer from night terrors where I have sleep paralysis like the mom in Night Terrors. There are so many amazing stories in this book which one is your favorite and why? Thank you for the kind words, first of all. I am a bit partial to Bewitched because I’ve always been drawn to dark and sultry stories. I just love the whole feel of that story. 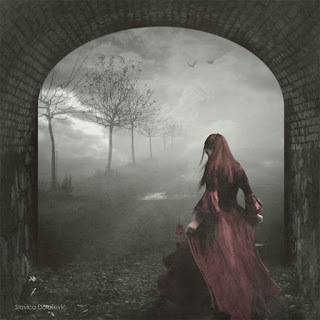 It’s witchy without coming out and saying that it is and I have loved it from the moment I wrote it. Your book was self-published. Can you tell us a bit about the process? The process was pretty intense. I loved being a part of all aspects of my book from writing to editing and then publishing, but it was certainly stressful. I got caught up in the small details of it all, the paper type, the formatting, the markets I would release to. You have so much control over pricing and distribution but at the same time a lot of the success and failure falls on you. I went through a great company, CreateSpace, to upload my files, buy my ISBN (International Standard Book Number), and print my book. Having all the steps go through one company (a daughter company of Amazon which made selling through Amazon very simple) was the smartest decision I made in the whole process. Are there any disadvantages to being self-published? There’s nobody there to guide you through the process (although there are plenty of self-publishing groups you can join) of editing, formatting, and printing. A lot of the research and information has to come from your legwork and asking other authors for advice. I would say another difficult part is that there is no help with marketing but it’s my understanding that even traditionally published authors have to do a lot of work to sell their books also. When I’m writing an article it’s very clinical. I sit down with an idea in mind, I outline it with headers or bullet points and get to work. When I write creatively it’s just about the most beautiful thing in my world. I sit down, I close my eyes (thanks to middle school typing class I have proper finger placement and can type without looking with ridiculous accuracy) and I write. I let my imagination run wild with my eyes closed. I see the story playing out and I write it. Sometimes I’ll have music on while I write and I just let the words flow. I just write. To me writer’s block, unless it’s an article or something structured, is a non-issue. From an imaginative and creative space, I’m always ready because I’m passionate about what I’m writing. When I have had to battle writer’s block for articles I take inspiration in other things I read, things I watch, or artwork. Inspiration is all around you and a lot of time what writer’s classify as ‘writer’s block’ is just the inability to make writing a part of their everyday. Once it is a part of your daily schedule the words will come-maybe not for your book but a poem instead, or maybe not for an article but a short fiction piece that day, but the words are there waiting for you. I am already working on a young adult fantasy novel so hopefully I can start publishing full novels. I’d like to challenge myself to more than just the snapshots that my short fiction pieces act as. I want to delve into characters and plots in a much more expansive way. I’d also love to be traditionally published for that young adult novel that I hope to turn into a series. But, as long as I’m writing still, I’ll be happy. So much of my time is spent working on websites, I will be launching a new site with a friend of mine (NobodysBeautyGuru.com) in March, I have my author website with a community for writers at JulieZantopoulos.com and now working on my next book that I don’t have much time when I’m not writing. I have a large family and I love spending time with them or my friends. I’m absolutely addicted to bad SyFy movies and going to concerts. I cross-stitch in my free time as well, which is something not many people do, but I love. I definitely keep busy and make time for family and friends between bursts of writing inspiration. Why should people read Shoot Down The Wendy Bird? I’m a little biased but I happen to think it’s a really great read. The stories are snapshots, moments in time explored through the eyes of really relatable characters. It’s a quick read, a fun read, and evoked a lot of different emotions throughout a lot of different genres and areas of writing. It’s a little bit of everything wrapped up in an easily digestible and passionate read. Plus, it would be supporting a hard working entrepreneur who has actualized her life’s biggest goal and that’s just good karma! 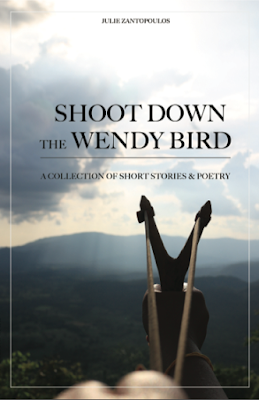 Enter the giveaway for your chance to win Shoot Down the Wendy Bird or purchase a copy here. Thank you so much for hosting a stop on my tour and for loving my book. I am so pleased to hear that your girls liked it, too. :) You asked such amazing questions.